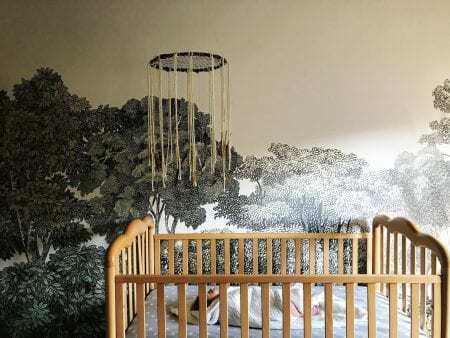 Our baby boy is finally here and we have been really slacking on getting his nursery completed. 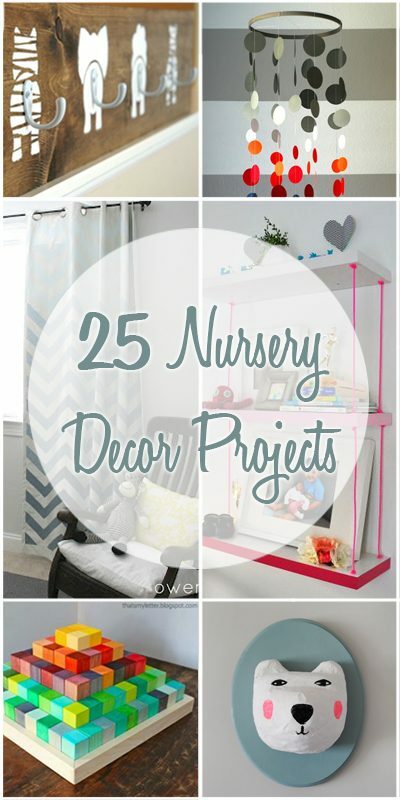 Before we even found out if we were having a boy or a girl I was already dreaming about our little’s room. I knew I wanted to go for a modern bohemian style and I couldn’t wait to put it all together! 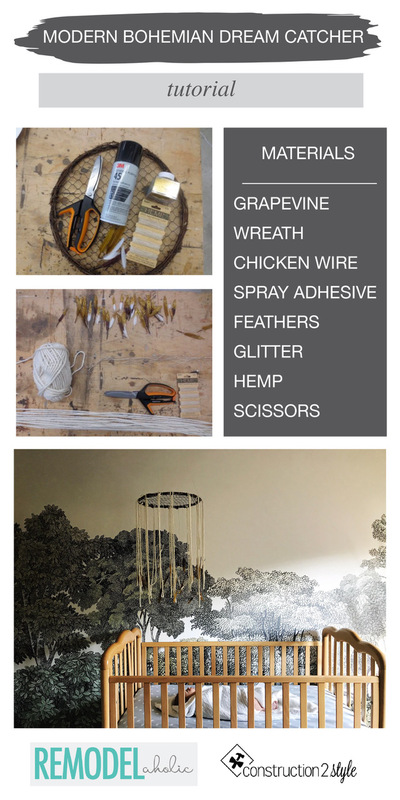 Here’s the mood board we dreamed up and put together for our babes when planning the space. Then of course once we found out what it was, and started shopping a few things changed and we kept wanting to DIY more and more. We built and added in a super simple wooden arrow, which we wrote a tutorial for on Remodelaholic here: Easy DIY Wooden Arrow Wall Decor. What I love about this style is that there are so many cool things you can make, hence why it’s taking us forever to get it all completed. ha! And the best part about this style…it can probably totally be a Pinterest fail and it would still be cute! 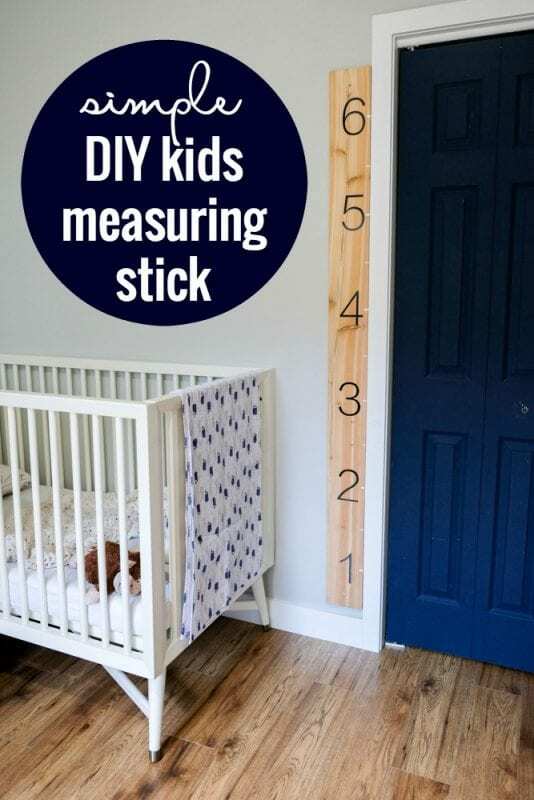 So you DIY first timers, this is for you! Because with this style it is all about being a free spirit…am I right?! We also knew from the beginning we either wanted to make a canopy cover or a modern bohemian dream catcher. 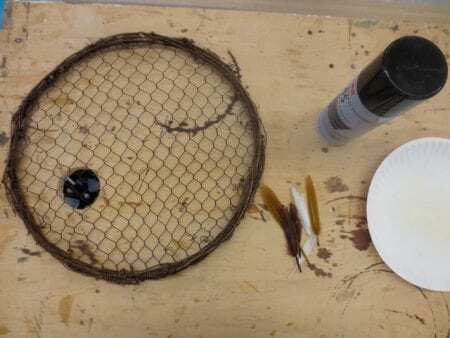 We decided on the dream catcher in the end becuase I cannot get enough of feathers lately, especially when they are sprinkled with gold. 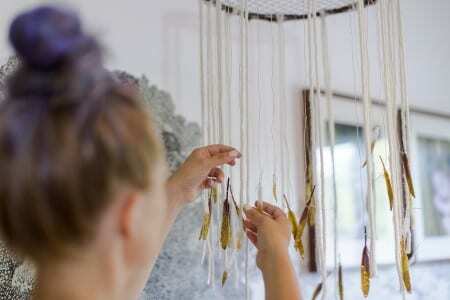 So today we’re sharing with you how to make a super simple modern bohemian dream catcher. Alrighty, so let’s get to it! First step is buying all of the materials. 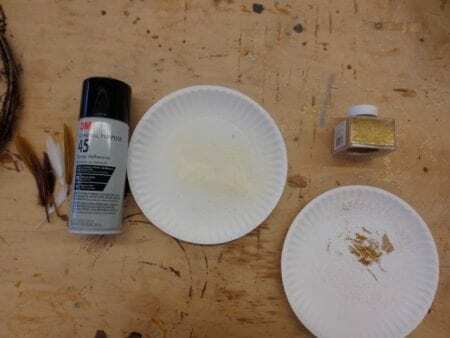 Which you can really find all of your materials any craft store for this project. 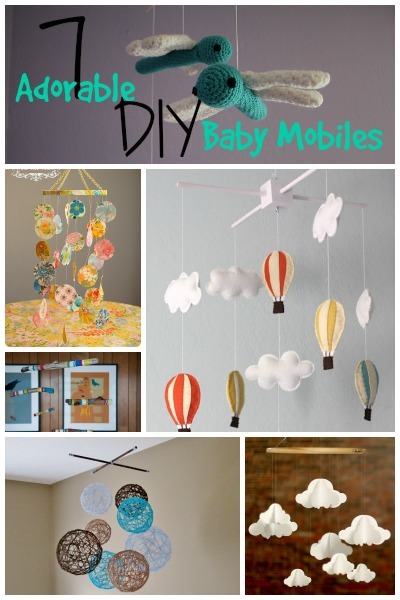 We picked up all of these items from JoAnn Fabrics for under $20. 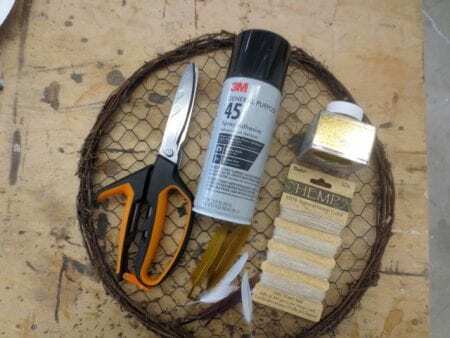 Once you’ve gotten your materials the next step is to assemble the grapevine wreath and the chicken wire. You can also buy these already assembled at craft supplies stores, just depending on how much you want to spend and DIY. There are also a ton of different options if you’re not feeling the grapevine wreath. I literally stood in the craft store for an hour wondering if I should go just with a gold metal hoop, a little hula hoop or ribbon or…the options are endless. And then for the middle instead of chicken wire you could also do a ton of different cool fabrics or lace. But in the end this is what my eye was drawn to. I wanted to keep a very earthy feel to the space. 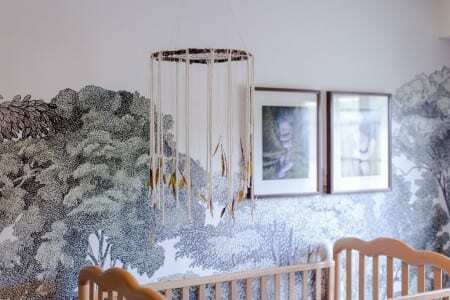 In the nursery I have forest wallpaper, so my vibe is very earthy so I knew the grapevine wreath would be the perfect accent to the wallpaper. 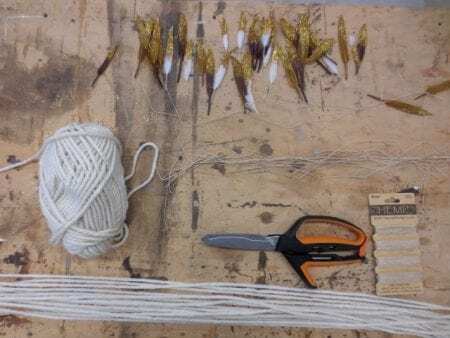 Next step is to get those feather’s glittered, being you’ll want them to dry for a few hours before you hang them so they don’t stick to one another once hung. 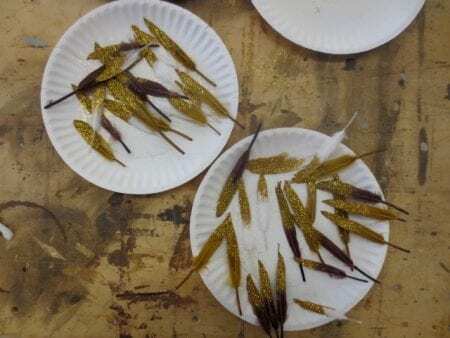 One by one we took a feather, sprayed the tips of the feathers with spray adhesive and then sprinkled gold glitter onto the ends. With the bohemian feel I don’t like to have things perfect. Well, I guess, I don’t ever like to have things perfect…I have too much ADD for that, haha! So there was no measuring or over analyzing where to spray. I literally just sprayed the ends care free and sprinkled away. Then I laid them out onto paper plates and let them dry out for a few hours. Then lastly I wanted to accent the feathers with some subtle yarn. So I used one cream colored piece of yarn becuase I wanted my dream catcher to be a little simpler and for the feathers to stand out, but it is adorable to have other colors and fabrics streaming as well. Again, if you like a lot of colors and textures I’d encourage you to use a ton of different fabrics. So if that’s more your style, don’t be afraid to go all out! Being our forest wallpaper is already so busy I wanted the dream catcher to be a little bit more simple with subtle tones. While the feathers were drying I took a cream colored yarn and cut my strips. 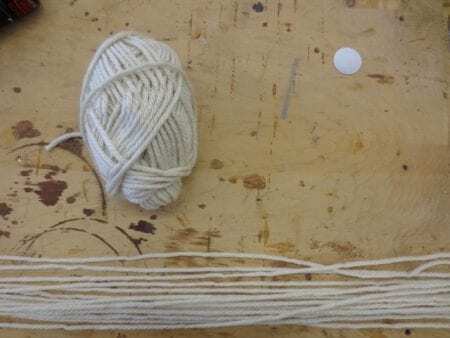 For the yarn, I doubled the length of what I would actually want them to hang at being I was going to loop them through the box spring wreath for the knot. Again, I didn’t measure. I just determined how long I wanted each piece and cut. I used the first piece as a guide but some were a little longer and others a little shorter and that is OK. The more imperfect it is, the better in my book. And then once I hung it, I cut off some of the longer pieces of yarn that were a little too crazy. To hung the dream catcher I took 3 strands of the hemp and tied them around the grapevine wreath securing the top with a knot. And took a little nail and nailed it into the ceiling. And there you have it! 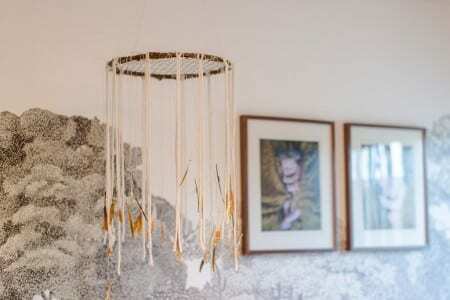 You’re super simple modern bohemian DIY dream catcher. All for under $20 and within a few hours time. Hey friends! Or soon to be friends! hehe. From the bottom of our hearts it is SO nice to meet you. We are Jamie and Morgan, a husband and wife home ​remodeling​, styling, and blogging team out of MN. We blog over at construction2style all about residential ​​remodeling, ​interior styling, ​carpentry, custom-built furniture designs…and our family (and probably a lot more TMI). hehe. We just want to help create a place for you to build your legacy within; your home. So we share as much as we can within very detail of our projects and within our own home.